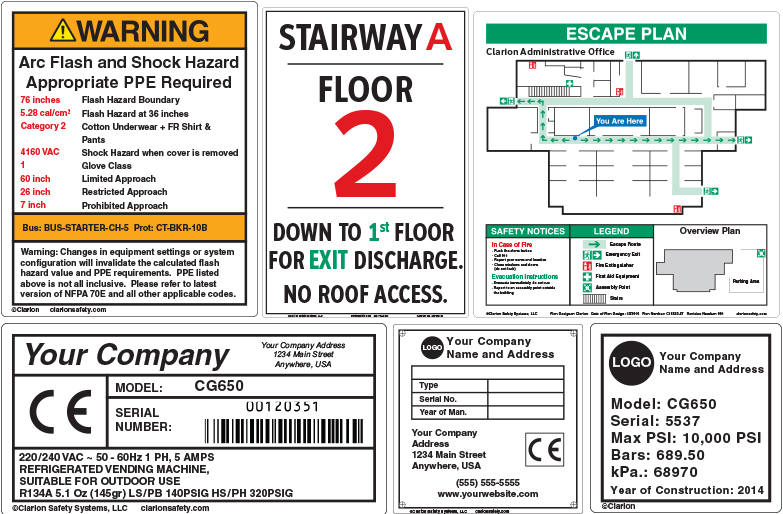 There are situations that call for a common, overall, safety sign or label design but where each individual sign or label has unique information on it. The final, end product of these projects are signs or labels that display some information that’s the same and other information that’s different. Clarion’s design team and our state-of-the-art digital printing equipment are your resources for creating, what we call, “variable data” signs and labels. The process begins with our Design Department creating an overall template that works for all of the project’s signs or labels. You tell us which fields of information are meant to change and which stay the same. Then you supply us with the variable data in spreadsheet form and our Customer Service Department, designers and production staff do the rest. It’s as simple as that! We specialize in partnering on fast, easy and precise customization – for safety signs and labels that meet your needs and today’s best practices. Our customization specialists are ready to work together to develop your custom warnings. To get started, use our online custom quote request tool. You can also contact us at (877) 748-0244 or compliance@clarionsafety.com to discuss how we can meet your needs with variable data on signs or labels.